Elf is an absolute Christmas classic, and is always my family’s first choice as soon as the tree goes up. Will Ferrell is at his rib-tickling best as innocent human-raised-by-elves Buddy who searches for his grumpy biological dad in New York, only to end up saving Christmas. Zooey Deschanel’s singing voice, the cheeriness of Santa’s workshop and the heartwarming sleigh ride which ties up the film in a big Christmassy bow; if I could bottle this film in a snow globe and keep it next to my bed I absolutely would. 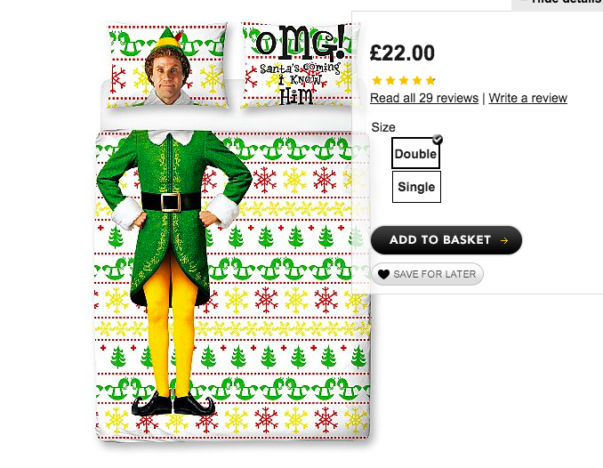 Luckily for me and countless other Santa believers, ASDA are selling Elf duvets, which are perfect for snuggling up in during a Christmas movie marathon. 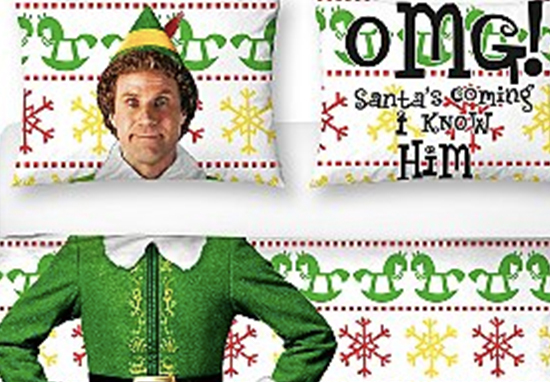 Fans of the hugely popular festive film Elf will love to snuggle up this Christmas in this cosy duvet set. The reversible, vibrant design features lovable elf Buddy on one side, and a fun festive design on the other side. It’s £22 for a double duvet set, or just £16 if you are still looking for your own Jovie to cuddle up with on a winter’s evening after a hard day of Christmas tree spotting and snowball fights. An absolute ideal purchase for the festive season. Now all you need is a hibernation stash of candy, candy corn, candy cane and syrup.